Another day, another tower. 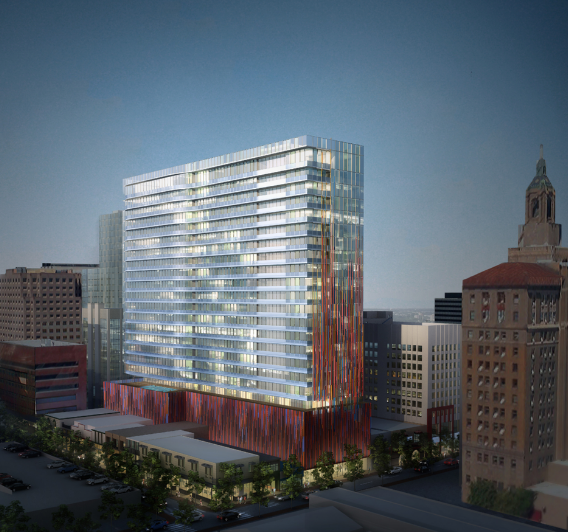 Nathan Donato-Weinstein broke the news of yet another high-rise proposal in Downtown San Jose. First, the bad news. Ross--currently Downtown's largest clothing store--is shutting down at the end of the summer. This will leave a 30,000 SQFT retail gap in a key location. Instead of replacing it with another store, the property owners are instead seeking to build a 24-story apartment tower. 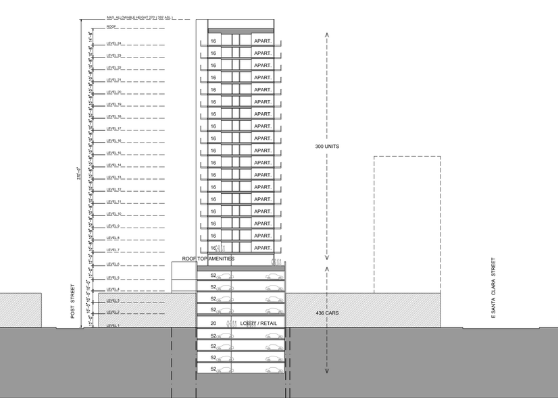 The modern glass tower would have 324 units and 5,000 SQFT of retail on the ground floor. It looks like amenities will be on the sixth floor and include a small swimming pool. I'm sure a gym would be there as well. Parking will be available on eight floors, four under ground and four above ground. The design and scale will be highly contested I'm sure since it is in the middle of the historic district. However, adding around 700 new residents to this area will no doubt be a huge benefit to the businesses in the immediate area and breathe new life into the district. Light-rail is also quite literally in front of the building, encouraging the use of transit instead of driving. Personally, I really like the mixing of old and new architectural styles--the San Jose Museum of Art is a great example which incorporated a historic post office. Also, I hate to say this but I also don't think there is enough character in the historic district today to justify blocking development that will add value to the whole Downtown area. There is huge value in maintaining the character and aesthetics of certain areas (especially when walking down the street transports you to a different era), but I don't think the historic district merits that today. We certainly shouldn't be tearing down any more historic buildings and repeat mistakes that were made decades ago, but it's time to move forward and evolve the Downtown area with greater density, amenities, and housing options. If the tower below moves forward, construction could begin by January 2017. Been discouraged lately in your work for the Lord? Let me share my personal story of how God found a way to meet me along the road of service. a big money project always has the first priority. too bad!